Turn on Veeam Cloud Connect – Now is the time! 200 Million reasons to turn on Veeam Cloud Connect! Now is the time! With the release of Veeam Backup & Replication v8 in 2014, Veeam redefined the way in which businesses of all shapes and sizes could extend their system and data Availability strategies to consume backup offerings from trusted service providers, with the launch of Veeam Cloud Connect Backup. Veeam Cloud Connect was made available for all Veeam customers who now had the ability to engage with a number of Veeam Cloud & Service Provider partners worldwide directly from their Backup & Replication console and configure offsite backup repositories to which virtual machines could be sent to over a secure internet connection, redefining the 3-2-1 rule of backups (three copies of data, on two types of media, one of which is off-site). When Veeam Backup & Replication v9 was launched, Veeam extended Cloud Connect to include Replication which further empowered Veeam customers to take advantage of service providers offering Disaster Recovery as a Service (DRaaS) to enable Availability and business continuity by holding virtual machine replicas offsite and giving those businesses the power to turn those replicas if disaster struck. When Veeam Backup & Replication 9.5 was released, Veeam further enhanced Cloud Connect Backup and Replication offerings with numerous improvements to both the service provider backend and the client facing front end. Levels of maturity and the product features were growing with every release. Now, with the industry leading networking extension appliance, partial failover functionality and overall ease of use, it’s time to look at Veeam Cloud Connect for your backup, replication and disaster recovery solutions. 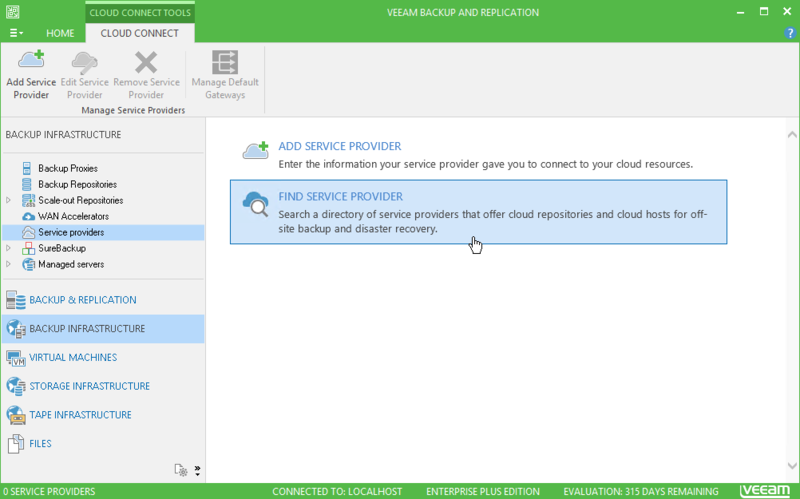 One of the beautiful things about Veeam Cloud Connect is that it’s built-in to Veeam Backup & Replication. All customers using this technology HAVE Veeam Cloud Connect, they simply need to choose a Veeam Cloud & Service Provider and turn it on! Veeam and its partners are giving away $200 MILLION in Cloud services ($1,000 USD per customer)! Yes, you heard that correctly. Veeam and its VCSP partners are giving away $1,000 in FREE Cloud Services to each and every one of our +230K customers using Veeam Availability Suite, Veeam Backup & Replication and Veeam Backup Essentials. Because of this unprecedented offer, right now is the BEST TIME to try backup and DRaaS in the cloud. You can avoid the cost and complexity of building and maintaining your off-site infrastructure while meeting business and regulatory requirements for off-site backup and DR.
Visit the FREE Cloud services promo page to learn more about this offer. Advanced image-based VM replication through Veeam Cloud Connect is simple to set up and easy to use through a VCSP and is as easy to setup as going to the Service Providers menu in the Veeam Backup & Replication console and choosing your service provider of choice. Once set up you have access to hardware plans that provide compute, storage and networking resources at the service provider end to which you can configure cloud replication jobs and manage failover scenarios by way of failover plans. When looking at disaster recovery testing and failover, one of the biggest challenges is in the networking. Generally speaking, there is complexity that surrounds ensuring VM replicas that are brought up at a disaster recovery site have the right networking in order for their applications and services to work. With the Network Extension Appliance, the tenant has the ability to map the internal VM networks as well as configure and publish external services to ensures seamless transition to the VM replicas during a failover. Perform failback tasks with VM replicas on the cloud host. Tasks associated with full site failover can be performed either by the tenant or by the service provider or through a Cloud Connect Portal hosted by the service provider that offers failover/failback operations. This flexibility allows the service provider to test the full site failover process and switch tenant’s production site to the cloud hosts upon request in the case that the tenant has no access to the backup infrastructure after a disaster. Ensuring that failover from the replica VM is successful is critically important, but there should also be a way back to access the on-premises infrastructure. Cloud Connect Replication features an option to easily failback to the primary infrastructure, by copying only data blocks changed while replica VMs were running on the service provider infrastructure. Cloud Connect Backup integrates hosted backup repositories or cloud repositories directly into the Veeam Backup & Replication console and is extremely simple to get started with via the Service Providers menu offering a way to search for VCSPs that are offering Cloud Connect Services. Once signed up and given your tenant account details, you are taken through a setup wizard that completes the process and allows you to then configure Backup or Backup Copy jobs to use the cloud repository. Cloud Connect Backup is a powerful addition to any existing Veeam customer and extends Availability into the cloud in a straightforward, secure manner taking the 3-2-1 rule of backups to the next level leveraging proven Veeam technology and service provider resources.